The cargo plane on the ramp is a C-17. Note the canards on the wing tips. The C-5 does not have. 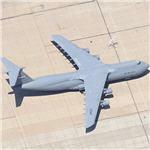 The aircraft in old style GM is a C-17 but the plane in the 45 degree imagery is most definitely a C-5. No canards on wingtips. I've updated the thumbnail to show it from further out. To see it you may need to enable the new Aerial feature in Google Maps by clicking on the little green "New" icon at the very top of the Google Maps page and then scrolling down to Aerial Imagery and select 'enable'. Thanks - I was looking at the older imagery.